ABYstyle designs and manufactures its own games and toys, products under official licenses! initiated by our fans and for our fans, the ABYstyle brand is a creator of clothes & textile items, decoration and everyday objects in the universes of manga, cinema, TV series, video games, comics and cartoons. Can’t stop losing your keys of Winterfell ? 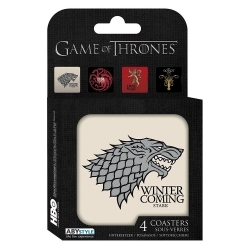 ABYstyle thought about you with this great Game of Thrones keychain of the effigy of the Stark family. 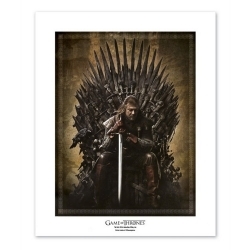 Ned Stark reigns on the iron throne on this wonderful collector artprint Game of Thrones by ABYstyle. The Iron Throne is printed in a limited edition of 1500 pieces with certificate of authenticity. The Starks, Lannisters, Targaryens and Greyjoys get together for a drink thanks to these Game of Thrones coasters by ABYstyle.